Russell Blackwood’s “Thrillpeddlers” is a unique San Francisco institution. This bizarre but talented and enthusiastic troupe of amateur and professional performers is eccentric in the extreme, specializing in revivals of the “Theatre of the Ridiculous” (mostly, but not exclusively, focussing on works by The Cockettes), and original work in the tradition of Grand Guignol. If the goods are rather odd, and the quality often uneven, you can, nevertheless, always be assurred of something different, sparkling, and over-the-top. Blackwood means to celebrate a time in our San Francisco history (the relatively innocent 1970s, before AIDs, before the assassinations of Moscone and Milk, before the horror of Jonestown, before the cultural appropriation by the Marina bros) when ridiculous counter-cultural shenanigans were the order of the day, and a revolution fueled by glitter not guns seemed not only possible but happening. So, that pretty much sums it up. 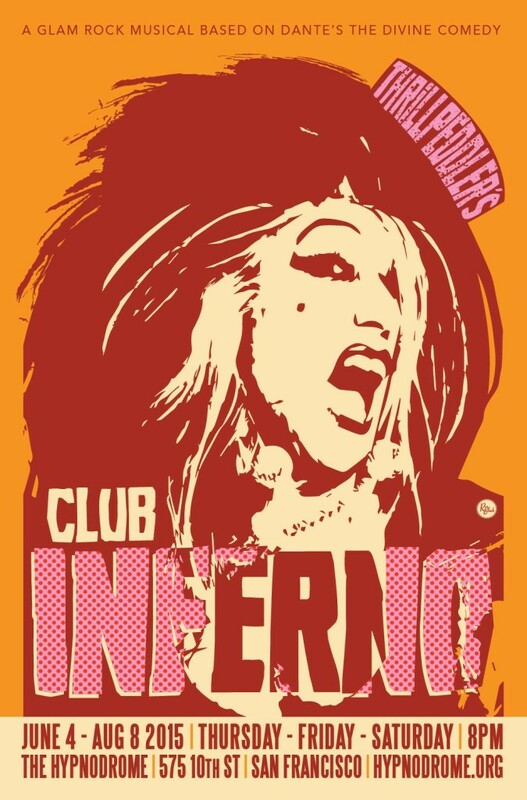 On a scale of one to ten the artistic excellence of “Club Inferno” is not going to break into multiples of two — but if you take it for it’s trashy worth, let your hair down and just have fun, you’ll probably have a fine time. And I dare you not to get a kick out of Birdie-Bob Watt’s off-the-wall comedic turn as Dante’s guide, Xaron. As always, Watt is an expert performer of all things ridiculous. “Club Inferno” continues at The Hypnodrome through August 8, 2015. For further information click here. “Cafe Inferno” by Kelly Kittel with music & lyrics by Peter Fogel, additional material, musical direction and arrangements by Birdie-Bob Watt. Director: Russell Blackwood. Choreography: Marilynn Fowler. Cast: Peggy L’Eggs, John Flaw, Birdie-Bob Watt, Noah Haydon, Leigh Crow, Zelda Kosnofsky, David Bicha, Barney Ford, Lisa McHenry, Amber Sommerfeld, Carol Ann Walker, Crystal Why, Diogo Zavadzki, Jason Wade, Owen Asdell, Tommy Salami, Tim Purdue and Steve Bolinger. Posted in Reviews.Tagged Birdie-Bob Watt, Charles Kruger, Club Inferno, Kelly Kittel, Marilynn Fowler, Peter Fogel, Russell Blackwood, San Francisco Theatre Reviews, The Thrillpeddlers, Theatre of the Ridiculous, theatrestorm. Are you serious? This play needs no qualifying low expectations~ if your friend didn’t get it- then he doesnt get the Inferno or comedic genius . Incredibly glib and mistaken review . Thi play is a masterpiece of modern reinvention. Kelly Kittell and Peter Vogel are auteurs my friend . Thanks for commenting. I didn’t really mean to imply anything as harsh as “qualifying low expectations” — I understood “trashy” in this context to refer to a style of camp humor that isn’t intented to be “good” in the conventional sense. Different expectations, certainly, but not necessairly “low” ones. I don’t know I’d callthe play a masterpiece, but I really appreciate you taking the time to respond! I am happy to say that, whether my review was or off point, the produciton has been a success and that’s good for Thrillpeddlers and what is good for Thrillpeddlers is good for SF theatre! Folks, don’t take our word for it: see for yourself! Whatever you think of the play, money invested to support Thrillpeddlers is money well spent!